Cherry, walnut, and maple. 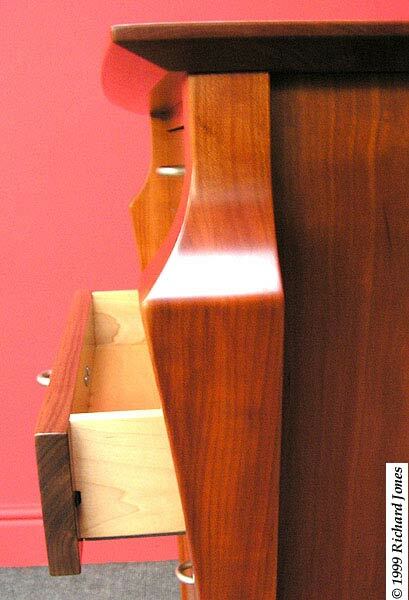 Varnished external parts and lacquered internal parts. Some years ago I was sketching and experimenting with leg shapes, including the traditional cabriole leg. Suddenly something like this variation of the cabriole leg form appeared on the paper; I was intrigued by it even though I had no particular use for it at the time. Later I decided it was appropriate for a hall table I was designing and building for an invitational exhibition I was taking part in Lake Jackson, Texas. On that piece, Guinness ... Reversed, the leg became slender and delicate. Hall tables or console tables don't need sturdiness in the same way that dining tables or coffee tables do as they are primarily decorative, so if Guinness ... Reversed showed a little movement if you pushed on it hard enough it wasn't critical. I wished to explore the use of this variation of the cabriole leg in other pieces of furniture, particularly in cabinet furniture, and forthcoming exhibitions in Philadelphia and Houston, Texas spurred me on to find a way to use it. 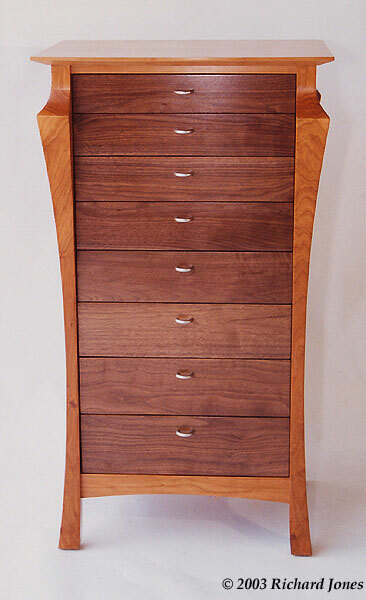 The end result was this chest of drawers in cherry and walnut with maple drawer parts. It was designed primarily to be attractive and for placing somewhere highly visible. There is no specified function that it 'should' perform. If placed in a hallway or living area for example it could serve as a focal point. 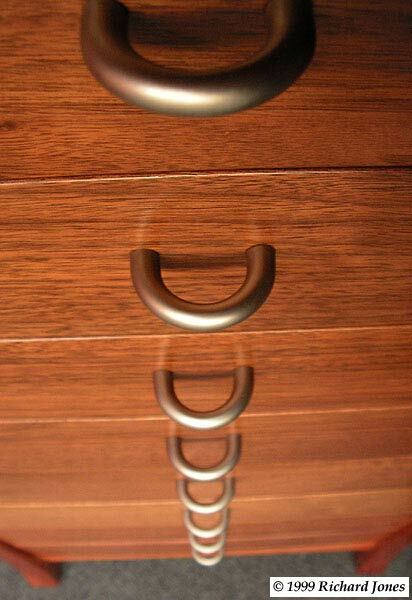 Do the drawers really need filling at all? I've lost count of the number of times this cabinet has been copied by other furniture makers, mostly amateurs; it is flattering that these makers go to the trouble of contacting me to ask permission to make a copy. 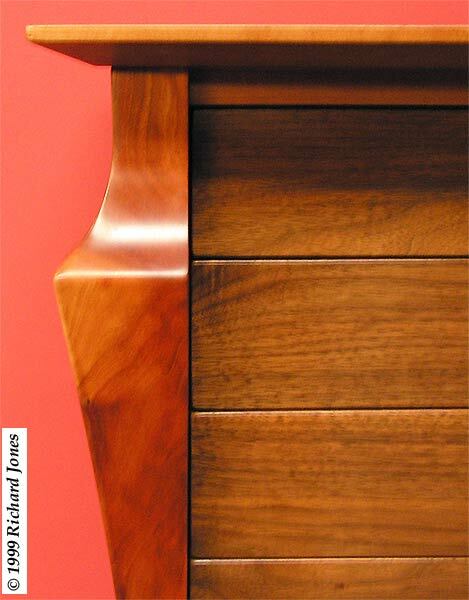 This chest of drawers has appeared in a few publications; no doubt this is the main cause of so many woodworkers getting in touch with me. The one sour note all the publicity this cabinet has attracted was the discovery that a woodworker had made as near an exact copy of this piece as he could and sold it to a client through an interior designer in North America. On the offender's website were spurious descriptions of the design process the maker went through, and there were various construction notes. The insult of shamelessly plundering and passing off of my design as the intellectual thief’s own work was compounded with the images used to illustrate the copyist's piece ... they were mine, lifted straight off my website and pasted into the offending maker's website! I could tell because of giveaway details such as the grain patterns, knots placements in the piece; and the position of barely formed heartwood at specific points. I reacted to this discovery with a lot of bad words, and followed this up by emailing the offender and demanding that my copyrighted images be removed from the website. After a fair amount of hard blowing self righteousness, and lame attempts to justify the blatant pillaging of my work, along with some bluster about my work and images being "out there and therefore fair game for anyone to use and copy" all references to the piece were eventually removed from the website. I watched the offender’s website intermittently for about a year because I was curious to see what this person would replace my images with. Nothing appeared. There were no photographs of the copyists version of my cabinet, and no modified description of the design process nor notes about construction details. This led me to an interesting possibility; that the offender never did make a copy of my cabinet. I began to wonder if it was the copyists ploy to ‘big up’ the work that had passed through the workshop by simply pretending to make and sell an item of furniture. 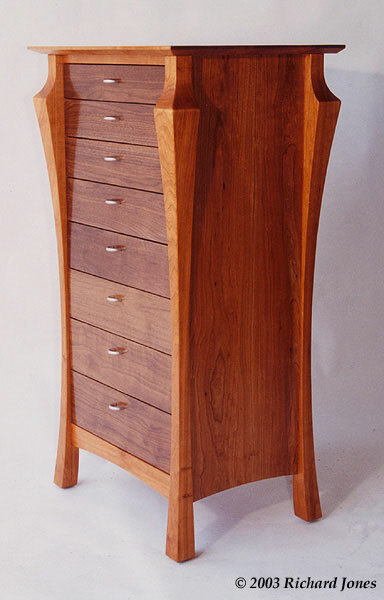 It wouldn’t have been difficult to do for there is an online version of my article describing all these details about this cabinet hosted here at the WoodCentral woodworking forum.